Amazon has unveiled its rumoured companion DVR device, Fire TV Recast, which will allow viewers in the US to watch, record, and replay free over-the-air TV programming. Users can connect Fire TV Recast to an HDTV antenna to stream free channels like ABC, CBS, FOX, NBC, PBS, and The CW over WiFi to a Fire TV, Echo Show, or compatible mobile device. 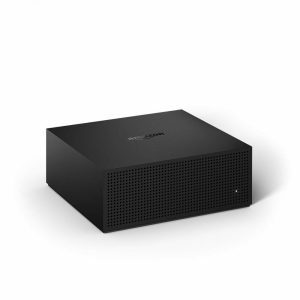 Amazon claims that the Fire TV Recast delivers “the most reliable video streams over WiFi of any over-the-air DVR,” and when connected to a Fire TV streaming media player or a Fire TV Edition TV lets users watch live, recorded, and streaming content in one place. The new Fire TV companion app for Fire TV Recast also lets viewers watch live and recorded content in or out of the home over their mobile network or WiFi. This is available free on compatible mobile devices with no monthly charges or subscription fees. “We are focused on making Fire TV an easy way to watch all the entertainment you love, whether it’s through streaming video services, cable and satellite providers, or even local broadcast stations,” said Marc Whitten, vice-president of Amazon Fire TV. Fire TV Recast is available in two models: a two-tuner version with 500GB of storage that allows users to record up to two shows at once and holds up to 75 hours of HD programming; and a four-tuner model with 1TB of storage that allows users to record up to four shows at once and holds up to 150 hours of HD programming. The two-tuner version is priced at US$229.99, while the four-tuner model costs US$279.99. Both are available to pre-order now in the US and will start to ship on November 14.